My son has had an Early Rider Belter for around 14 months. Recently, I've noticed the free-wheel sounds "gritty", and there is quite a bit of friction if you move the cranks backwards while the rear wheel is spinning, exactly as shown in this YouTube video (posted by someone else... clearly the hub has issues). I've removed the rear wheel and taken a look at the sprocket. It's not like Shimano hubs I'm familiar with. 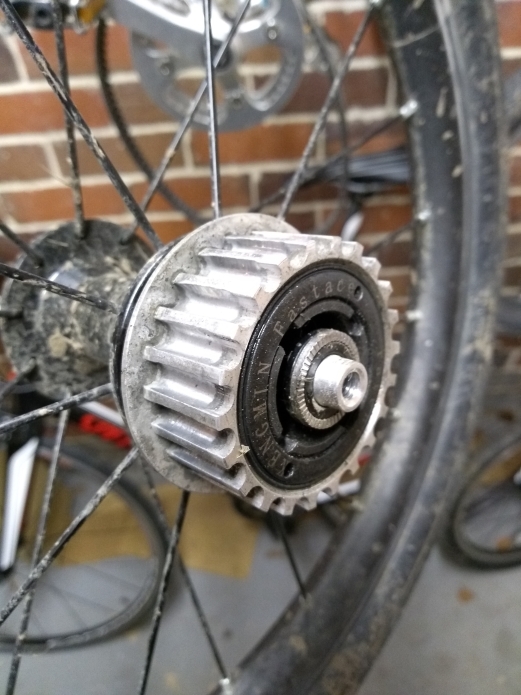 Can this hub be serviced? If so, how does it come apart, and what tools will I need? It appears to have "KENGMIN fastace" printed on it, but a google for this term doesn't provide anything useful. Fastace is a maker of bicycle components. That looks like a freewheel with one belt drive sprocket instead of 5 or more chain drive sprockets. See the Terminology Index for a description of the difference between freewheel and freehub/cassette systems. 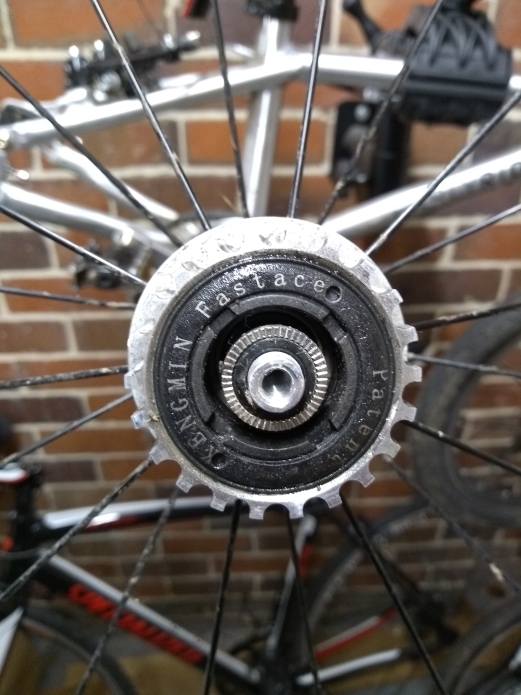 The belt drive freewheel should be removable with a four tooth removal tool (see the Park Tool video below for tool selection guidance). You'll then need to get inside the freehub to clean and re-lube the bearings and racheting mechanism. I believe that's done using a pin spanner to unscrew the rings with 'KENGMIN fastace' written on it. See the RJ the Bike Guy video below for a idea how the might be accomplished - your freewheel might be a bit different, but it gives you and idea of what to expect. As an aside, that's an interesting kids bike. Not sure I like the radial lacing of the rear wheel though. Not the answer you're looking for? Browse other questions tagged maintenance hub sprocket belt-drive or ask your own question. 7-speed MTB cassette on 8/9-speed wheel hub, where does spacer go? Why is my Hope XC freehub locking when the quick release is tightened? Why is it important to keep bearing sets when greasing a campagnolo hub? Hub dynamo, maybe loose contact; maintenance? Can a hub casing be warped/bent?